TALES OF TERROR BY AUTHOR D. W. GILLESPIE-‘HANDMADE MONSTERS’ NOW AVAILABLE! Pro Se Productions, a publisher of Genre Fiction, proudly introduces a new voice in horror to eager readers. Author D. W. Gillespie’s HANDMADE MONSTERS, a collection of chilling tales, is now available in trade paperback, hardcover, and digital formats. A lonely housewife finds one hiding in a hole in her closet. A family finds one inside the burned out husk of an old tree. A young girl finds yet another in the form of a baby unlike any she's ever seen. But the worst of all are the monsters hiding inside us, always there, waiting to be set free. Collected from over five years of writing, D.W. Gillespie's collection of 13 dark tales features a mix of previously published and never before seen stories. From the gruesome to the surreal, HANDMADE MONSTERS is for anyone who might have their own monster hiding away inside. From Pro Se Productions. 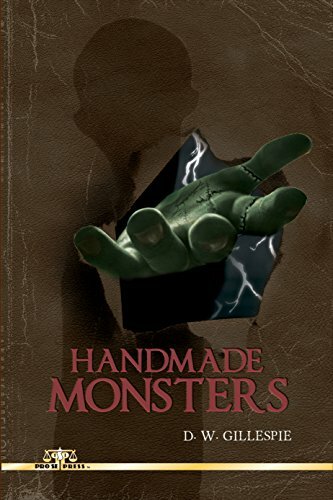 With a stunning cover and logo design and print formatting by Marzia Marina and Antonino Lo Iacono, HANDMADE MONSTERS is available now in paperback at Amazon at https://www.amazon.com/Handmade-Monsters-D-W-Gillespie/dp/1720819114/ref=sr_1_2?ie=UTF8&qid=1528923642&sr=8-2&keywords=handmade+monsters+gillespie and Pro Se’s own store at www.prose-press.com for 15.00. Gillespie’s first collection is also available for only $2.99 on Kindle as an ebook at https://www.amazon.com/Handmade-Monsters-D-W-Gillespie-ebook/dp/B07DK2TT4H/ref=sr_1_1?ie=UTF8&qid=1528923101&sr=8-1&keywords=handmade+monsters+gillespie. Kindle Unlimited Members can read this title for free! HANDMADE MONSTERS is also available in hardcover at http://www.lulu.com/shop/dw-gillespie/handmade-monsters/hardcover/product-23677723.html for $29.99.